Scarce nautical chart detailing the China Coast between Taiwan, Hong Kong, and the Philippines. A large and impressive 1872 nautical chart by James Imray covering southeastern China in the vicinity of Hong Kong and Guangdong Province, southern Taiwan, and the northern Philippines (Luzon and Mindanao). Two trade routes are identified including the 'Usual route to and from Hong Kong in fair Monsoon' and the 'course to Hong Kong in the Northeast Monsoon.' The chart achieves its greatest detail and accuracy in the vicinity of Hong Kong and Macao as well as in the seas around the Pescadores Islands between Taiwan and the China coast. Manila Bay, in the Philippines, is also well mapped. This is part of a nine-map series Imray issued to illustrate trade routes between Singapore, China, and Japan. It corresponds to Chart no. 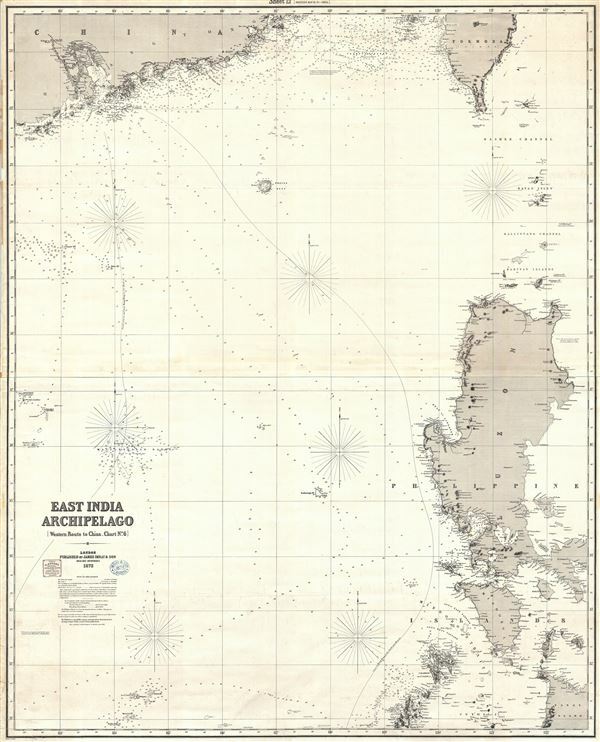 6 in the 'East India Archipelago' series and chart no. 12 in the 'Western Route to China' series. Imray's stamp, bearing an 1873 date, appears near the title. It is not clear what this means as no further updates are apparent on the chart. A pastedown, also near the title, identifies H. Hughes, a ship's chandler established at 58 Fenchurch St., London, as the original seller. James Imray (May 16, 1803 - November 15, 1870) was a Scottish hydrographer and stationer active in London during the middle to latter part of the 19th century. Imray is best known as a the largest and most prominent producer of blue-back charts, a kind of nautical chart popular from about 1750 to 1920 and named for its distinctive blue paper backing (although not all charts that may be called "blue-backs" actually have a blue backing). Unlike government charts issued by the British Admiralty, U.S. Coast Survey, and other similar organizations, Imray's charts were a private profit based venture and not generally the result of unique survey work. Rather, Imray's charts were judicious and beautiful composites based upon pre-existing charts (some dating to the 17th century) and new information gleaned from governmental as well as commercial pilots and navigators. Imray was born in Spitalfields, England, the eldest son of a Jacobite dyer also named James. Imray did not follow his father profession, instead apprenticing to William Lukyn, a stationer. He established himself as a bookseller and bookbinder at 116 Minories Street, where he shared offices with the nautical chart publisher Robert Blanchford. In 1836 Imray signed on as a full partner in Blanchford's enterprise, christening themselves Blanchford & Imray. At this time the Blanchford firm lagged far behind competing chart publishers Norie and Laruie, nevertheless, with the injection of Imray's marketing savvy the firm began a long rise. James Imray bought out Blanchford's share in 1846, becoming the sole proprietor of the chart house, publishing under the imprint of James Imray. Relocating in 1850 to larger offices at 102 Minories, Imray was well on track to become the most prominent chart publisher in London. In 1854, when Imray's 25 year old son, James Frederick Imray, joined as a full partner, the firm again changed its imprint, this time to James Imray and Son. The elder Imray was a master of marketing and was quick to respond to trade shifts and historic events. Many of his most successful charts were targeted to specific trade routes, for example, he issued charts entitled "Cotton Ports of Georgia" and "Rice Ports of India". Other charts emerged quickly following such events as the 1849 California Gold Rush. Imray's rise also coincided with the development of governmental mapping organizations such as the Admiralty and the U.S. Coast Survey, whose work he appropriated and rebranded in practical format familiar to navigators. Imray's death in 1870 marked a major transition in the firm's output and began its decline. Though Imray's son, James Frederick, excelled at authoring pilot books he had little experience with charts and issued few new publications. Most James Frederick Imray publications issued from 1870 to 1899 were either revisions of earlier maps prepared by his father or copies of British Admiralty charts. Charts from this period are recognizable as being less decorative than the elder Imray's charts following the stylistic conventions established by the Admiralty. The Admiralty itself at the same time began to rise in prominence, issuing its own official charts that were both cheaper and more up to date than those offered by private enterprises. By the end of the century the firm was well in decline and, in 1899 "James Imray and Son" amalgamated with the similarly suffering "Norie and Wilson", which was itself acquired by Laurie in 1904. Today it continues to publish maritime charts as "Imray, Laurie, Norie and Wilson". Good. Backed with blue paper. Verso repair lower left corner.